We encountered Mark Fostenburg during a “Strangers and Freaks” mission while playing as Trevor Philips. Nigel and Mrs. Thornhill, the celebrity-crazy Brits for whom Trevor ends up stealing celeb paraphernalia, wanted nothing more than one of Fostenburg’s unique and expensive golf clubs for their collection of memorabilia. The resulting mission sees Trevor violently interrupt a golf game. Fostenburg seems to be loosely based on actor Bruce Willis. 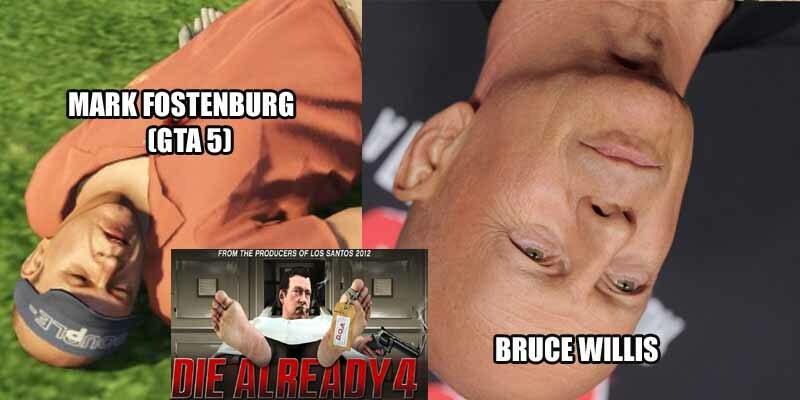 Both are bald, and aside from that, Fostenburg is the lead actor in a successful series of films called “Die Already” which sounds very similar to Bruce Willis’ Die Hard flicks.